Domain can best be described as Othello? played with Blokus pieces. Actually, pieces are not flipped when they are surrounded by pieces of other colours (as in Othello/Reversi? ), but when they are touched by a newly-placed piece of the opposite colour. 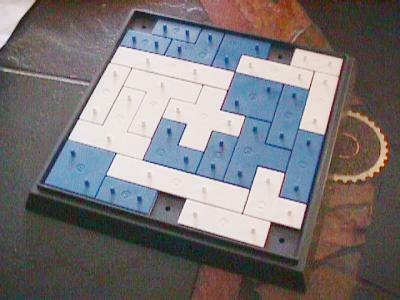 Otherwise, the intermediate version, which is the most playable version of the game according to Abstract Games Magazine, is indeed very similar to Othello. Players must flip at least one opposing piece on their turn, or else pass. Domain was published in the early 1980s.